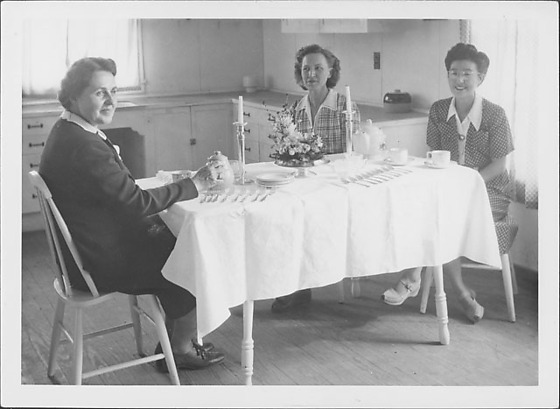 Portrait of three women, two Caucasian and one Japanese, sitting around table set for tea in sunlit room, probably a kitchen, at Rohwer concentration camp, Rohwer, Arkansas, November 3, 1944. Caucasian woman in dark suit sits at L with proper R hand on teapot. Smiling Japanese woman in polka dot dress and eyeglasses sits at opposite end of the table. Caucasian woman in plaid sits in between. Table is set as for tea service, with silver candlesticks and flower arrangement in center. A row of forks on the L corner of the table is complemented by a row of spoons on the R corner. Countertop and cabinets at rear are largely bare, as is wooden floor. Stamped on back, C: NOV 3 1944. Written in pencil, CR: [circled letter] D.